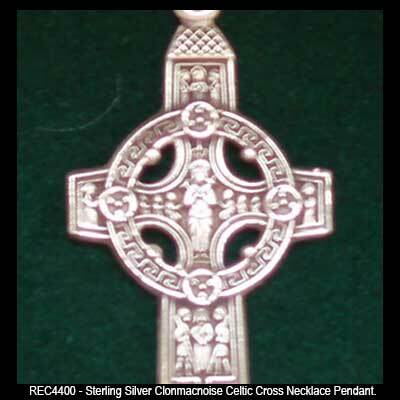 Celtic crosses necklace for men is a sterling silver design of the Cross of Scriptures, located at Clonmacnoise, Ireland. Each diorama on the Cross of Scriptures necklace depicts an event from the New Testament. The sterling silver Cross of Scriptures necklace is a highly detailed replica of the west face of the 9th century monument that is located at the monastery at Clonmacnoise in County Offaly, Ireland. 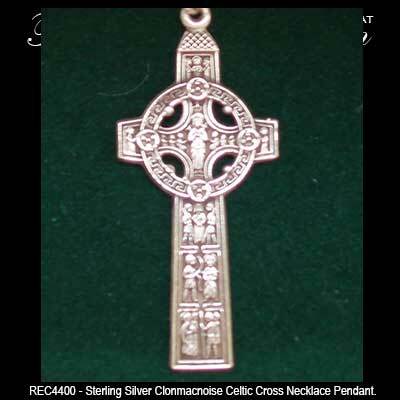 The Clonmacnoise Celtic cross pendant measures 3/4" wide x 1 3/4” tall, including the jump ring and the chain bail, and it includes a 24” long sterling silver chain. The men's sterling silver necklace is gift boxed with legend card detailing the diorama on the Cross of Scriptures along with a Celtic cross history card, complements of The Irish Gift House. 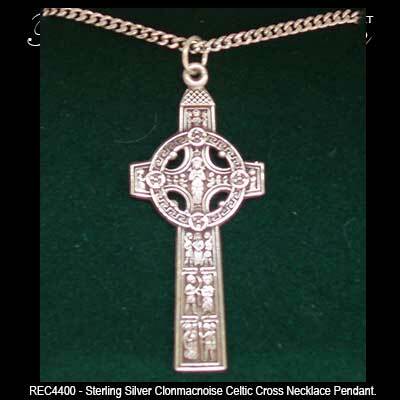 This Celtic cross necklace is made in the United States and it is one of our best selling designs for men.